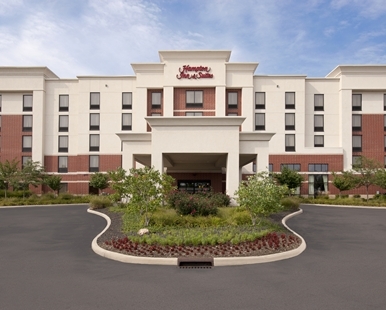 The Hampton Inn & Suites Columbus-Easton Area hotel sits a few steps away from Easton Town Center, which offers some of the best dining, shopping and nightlife in Columbus, Ohio. Amenities included in your rate are our free hot breakfast, wireless internet access, an in-room coffee maker, and access to our 24-hour business center. You�ll find Columbus has a lot to offer. Visit the Columbus Zoo and Aquarium, just 17 miles away. Cheer on the NHL Blue Jackets at Nationwide Arena or spend the day at the Center of Science and Industry. If you�re unfamiliar with the area, our staff will be happy to suggest things to do near Easton Town Center. After a day of sightseeing and shopping, return to your room in our Easton area hotel and slip into your clean and fresh Hampton bed� for a good night�s sleep.